Nails are one of the hottest new fashion accessories, with so many new colors, textures, crackles and styles coming onto the market every day, that it is hard to keep up with it all. Magazines such as Nail It – the first lifestyle magazine for women who love nails — are hotter than ever. Recently, apparently, on the catwalks of Fashion Week in Paris, some of the prestige brands even featured stick-on nails emblazoned with their names and logos, which were seen on the fingers of some of the femme fatale models. With colors in every shade of the rainbow, and I must admit that Essie is my new BFF. Essie’s formulations are fantastic, and the shades (with adorable names) go on like a dream. Here’s the color combo that I just came up with, which I’m crazy about. I start with a base of Essie UnderWhere – a light pinky purple – and then do a reverse French manicure at the tips, with not a shade of white, but with the deep dark blue-purple of Using My Maiden Name. 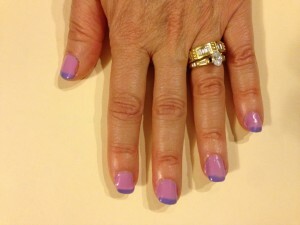 For someone who loves the hues of pink and purple – that’s me – this is going to be my go-to treatment for divine digits. My fingers look so fabulous I can’t stop staring at them. As a writer who specializes in writing about traveling in style, I’m all for packing a few ounces of nail polish — a great accessory that can make a world of difference.